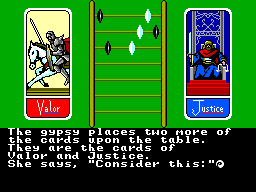 Ultima IV is a rare design for RPG games. Most games of the era were stroy driven, grind orientated or rogue like clones. an open ended, free roaming RPG wasnt something you got a lot of and it's a style of game that I have only seen continued by the Elder Scrolls series. 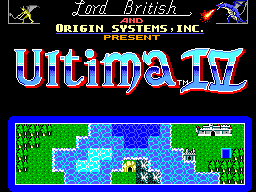 Ultima IV was by far the best in the series leading up to this point and along with Ultima 5, I think provide the best two games of the series, and the Master System version of the game is in my opinion as good as it got. This is the rich diamond that makes this game such a cult classic. It isn't a game that leads you by the hand through an intriguing story or rich with bosses and endless grinding. It is a game that says "this is what's going on" before kicking you out the door and leaving you to flounder around the world like a dying fish trying to figure out what on earth you are meant to be doing. That may make it sound harsh, but the truth is, it's the lack of knowing anything that makes this game such an amazing journey. You talk to people in towns, discover more towns, fight increasingly horrible enemies, embark on crazy trasure hunts that encompass the globe and all of it is provided in snippets of information from the town people and a handful of individuals who are in the knowledge of some powerful secrets. The point of this game is discovery and it's something that has been very well designed into the game. The graphics are sadly a huge improvement over the DOS version. They are clear, relatively well detailed and pretty, but see one rock, you see them all. Some variation between the town icons, guards and so on would have been nice. Maybe some directional feedback as your character icon quite literally has two frames of animation but I won't complain as it could have tried to do more and compromised it's stability or added funny bits and bobs that would have just got in the way. As basic as the graphics are, they are clear, bold and functional and for that alone I give it a neutral grade. Again... so much better than the DOS version. The songs are nice and everything but again, a real lack of variation going on here. Every town sounds the same, the map music REALLY grates on you after hearing it for the first one hundred hours that this game can provide in gameplay. The sound effects are really nothing fancy. Bleeps and bloops and not a lot else going on here. That being said, the opening music (also the town music) and the dungeon music stick in your head as wonderfully nostalgic. There is a happy feeling that goes through my brain every time I boot the game up. That might just be me though. 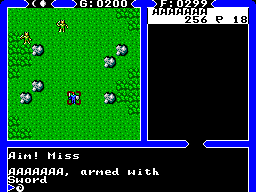 Again, thankfully, A huge improvement over the DOS version. The crazy keyboard mapping has been replaced by a nice little selection menu. The only time I find the controls become an issue are when you are trying to navigate a full party through the action rooms in the dungeons. It can prove VERY clumsy then. Otherwise, no faults with the controls. 1 is cancel and can be hit with impunity to get out of menus, conversation and even ships! 2 is your select, so brings up the menu, confirms a selection and selects conversation options for you. Simple but it works fine. Nothing especially innovative going on here. The two things this game has going for it are the open ended world to explore and how long completing this game can take. I could not even begin to imagine how many hours I spent on this game but if I could ever work it out, I would only feel pride for having done so. If you do not get outside help telling you how to beat the game, this game will take you a VERY long time. Most people I've come across who have beaten this game said it took them years to do so. It took me 15 but that was with a 10 year gap! If my constant gushing didn't give it away, I LOVE THIS GAME! It is in my top 3 all time favourites for any platform and although this is most definitely a game for a very particular sort of gamer, it is by far and away the most rewarding of its kind. The only thing I will recommend for the truly dedicated RPG fan is do not look up the locations of items or anything like that. It will only rob you the fun of discovery that this game has in spades. There are some things you need to know which the documentation that came with the game provides and I'll leave a note pad file which tells you what you really need to know to get started. The rest is more fun to find out for yourself. Once you complete it though, it doesnt have much to pull you back in other than to challenge yourself as you remember too much of it. It's a game really worth leaving for a very long period of time and coming back to it when you have forgotten nearly everything. This is not a game you will beat in one sitting so give it the time and respect it deserves and in turn it will reward you back.